With the compact Bistro electric French press coffeemaker, you can finally enjoy the rich coffee taste only a French press can produce along with the ease-of-use of an electric coffeemaker. 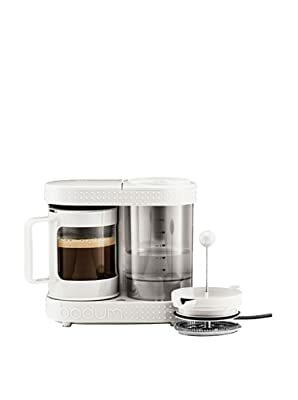 The BISTRO Electric French Press Coffee Maker combines the press-a-button drip system with the rich coffee taste only a French press can produce. After all, hot water is all it takes: now you just don't need to boil it separately. Just simply fill the water tank with fresh, cold water and add ground coffee into the glass jug. Then press the button and you're done. No filter needed. When all the hot water is in the glass jug, you press down the plunger and your coffee is ready to be poured. The heating element will keep your coffee nice and warm. The BISTRO Electric French Press Coffee Maker is made from plastic, silicone, stainless steel and borosilicate glass.